Here are five examples showing a lighter touch when tying a product line to a holiday or pulling a customer back to an online shopping cart to close the sale. Try these tactics for your brand. We all love a good laugh. Even the most serious email marketers (and customers) enjoy levity. Humor has long been a vital part of marketing. When it comes to email marketing, it’s often the message with the funny gag or gif that cuts through inbox clutter. 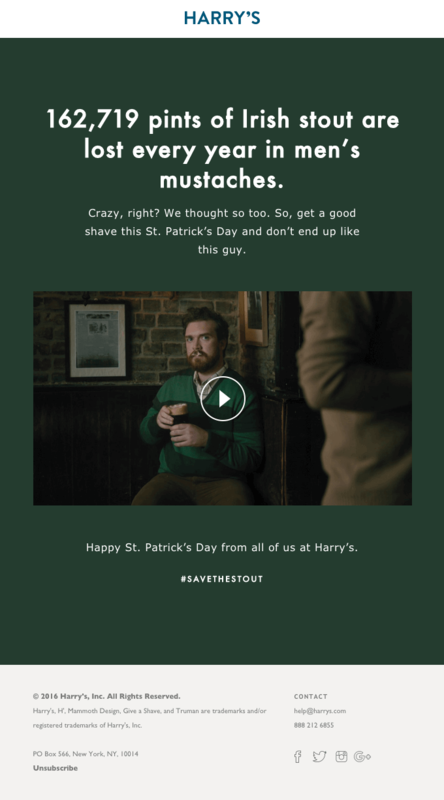 That email from Harry’s, sent before Saint Patrick’s Day, takes the cake—and the stout. While wishing their subscribers good tidings on the special day, Harry’s offers a perfect product tie-in. Short, punchy copy, a funny video, a perfect use of the hashtag #savethestout—everything about this email works. However, one important thing is missing: the call to action. Poncho sends personalized weather alerts to its subscribers. What sets its email apart is their whimsical, wry writing. Who said weather reports have to be boring? Poncho’s copy is an amalgamation of facts and suggestions, but with a comical touch. Poncho also uses bizarre hero images that bring a smile. There’s also space for enlisting other ways to connect with the company, which ensures better engagement with the brand. MailChimp certainly knows how far you should take humor in emails. It’s conducting a survey through this email to help them improve their newsletter. Though the humorous opening line grabs attention, it gets to the point quickly, prodding recipients to take the survey. A cart-abandonment email must be about persuading the prospect to buy what they left in the cart, but the way you do it matters. Whisky Loot’s brilliantly funny take on why the would-be customer should be buying from them is engaging and entertaining. The witty email copy ends by answering some frequently asked questions using a serious tone. Raise a glass for this email. Here’s another excellent cart-abandonment email. Ray-Ban’s way of nudging the customer to complete the purchase is funny and engaging, yet helpful without being pushy. The company shows essential details of the abandoned product with a CTA to help them make the purchase without any hassles. The most important question you should ask yourself before using humor in your campaigns is: Is it relevant to your subscriber list, campaign idea and your brand image? Proceed only if the answer is yes. Remember that not all your campaigns should have a humorous tone. You don’t want to lose the element of surprise. Also, because your primary goal behind an email is marketing, a joke without a marketing message is just a joke. 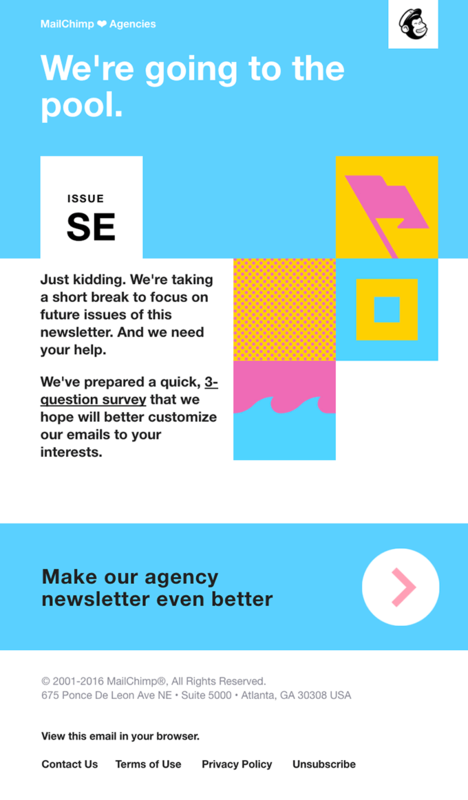 The idea is to subtly sprinkle humor into email campaigns—when appropriate—using it as a catalyst that encourages subscribers to click on your call to action. Ideally, you should start small. Try using a conversational, warm tone in your email copy, and add subtle humor. Check the email performance to see whether you’ve found your subscribers’ funny bone. Another good practice is to A/B test. Pit a serious tone against a humorous tone, or try two different attempts at using humor in email. Humor can help you cultivate a genuine connection with your subscribers, but it could backfire spectacularly. The last thing you want is to go viral for all the wrong reasons. A good understanding of your audience is a must if you wish to incorporate humor into your strategy. Will they get the joke? That’s your responsibility. Kevin George is the director of marketing at Email Monks. A version of this post first appeared on the Email Monks blog.